The lack of ability to internalize personal accomplishments and the constant fear of being exposed as a "fraud"
Impostor syndrome, or impostor experience, is the lack of ability to internalize personal accomplishmentsPersonal BrandOur personal brand is what people see in us. It reveals who we are, what we offer, and what we value. When we work in a company, our colleagues create a perception about us based on how we present ourselves to them. This can either be good or bad, depending on how and the constant fearEmotional IntelligenceEmotional intelligence also known as the emotional quotient (EQ) is the ability to manage one's emotions and the emotions of others. For business leaders, high EQ is essential to success. This guide covers the five elements of emotional intelligence and their relevance to characterizing a successful leader. 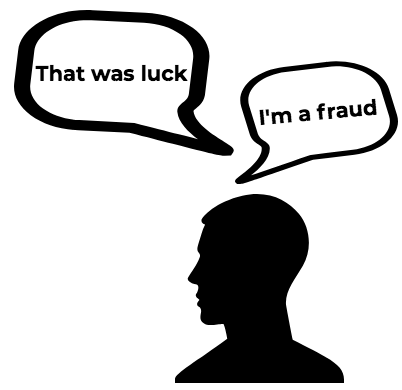 EQ vs IQ of being exposed as a “fraud.” The term was first used in 1978 by psychologists Pauline R. Clance and Suzanne A. Imes. People with impostor syndrome dismiss success as luck, timing, or as a result of tricking others into thinking that they are more intelligent and competent than they really are. The imposter syndrome is commonly found among high achievers or those in high-pressure environments. Individuals who suffer from the impostor syndrome possess a strong belief that they are not intelligent and that they are fooling anyone who thinks otherwise. The impostor syndrome has been acknowledged by psychologists as a specific form of intellectual self-doubt. I often succeeded in a test or task even though I was afraid that I would not do well before I undertook the task. For all the indicators, refer to the Clance IP Scale. Individuals with impostor syndrome may hesitate to even consider applying for certain jobs for fear that they are not good enough. People who deal with impostor syndrome will likely downplay their accomplishments. It fills the individual’s mind with self-doubt and a belief that their accomplishments are due to sheer luck. Steer away from the “what-if” situations and only focus on the present. Perfectionism and striving to be flawless provide unnecessary stress and anxiety. Recognize that nothing and no one is perfect and that problems will inevitably exist. Chances are, those around you feel like an impostor as well. Reach out for help, discuss how you feel with those close to you, and recognize that you are not the only person with this feeling. Do not get fixated on negative feedback, embrace positive feedback, and internalize compliments by others. Attributing successes to luck undermines your abilities and your approach to life. Be grateful for your successes and take ownership of your accomplishments. Do not compare yourself to others, respect your own experiences, and understand that you are just you. The impostor syndrome cannot be fully eliminated, but there are ways to minimize the feeling of being an impostor. In a TEDx Talk by Lou Solomon, a CEO, author, and communications expert, he provides a very insightful talk on the impostor syndrome. Jonathan, an 18-year-old, graduated high school at the top of his class and is headed off to attend Stanford University. Jonathan feels terrified and convinced that the admissions department at Stanford has made a mistake and that he does not deserve to go to the prestigious university. Sara is a leading researcher in the field of corporate finance and frequently travels around the world to conferences and workshops. Recently, Sara attended a big conference. As introductions were taking place, Sara noticed other highly accomplished researchers. Despite being a prominent researcher in the field, she feels that she doesn’t belong and that she may be called out by others as a fraud. Matt recently joined a boutique investment company as an analyst. Over the past couple of months, Matt has been receiving high praise from executive partners and the managing director. In fact, Matt had recently received a bonus for helping lead a cross-border mergers and acquisitions deal. When asked by colleagues regarding his success in the company, Matt attributes it to sheer luck. Thank you for reading CFI’s explanation of Impostor Syndrome. CFI is a global provider of financial modeling training and career advancement for finance professionals. To learn more and expand your career, explore the additional relevant resources below.